Dream flows recently acted on KRB's request to post the gauge for the mouth of Kern Canyon run. The Mouth of the Canyon this Summer? While PG&E's Kern Canyon Project (KCP) was down for repairs between Summer 2014 and last month, Dennis Rushing, Kyle Rushing, Jeff Matheson, and other boaters popularized the 1.5 miles of bypassed reach into a run they named "The Mouth" for its proximity to the mouth of the canyon. The put in is just below SCE's KR1 powerhouse (there's even a USFS manifest box there), and the takeout is at the KCP powerhouse at the mouth of the canyon on 178, just across from the "Kern drowning victims" sign. Although this stretch had been boated infrequently before, it had always been boated at average summer release levels in the 1000+ cfs range. During the nine months KCP was down for repairs, the watermaster regularly released flows from the Isabella reservoir at levels between 150-300 cfs. 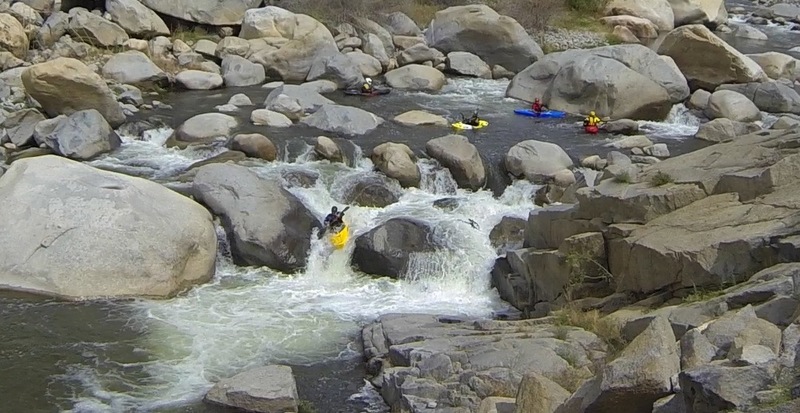 Dennis and the rest of the Bakersfield gang probed the run repeatedly, dialed in the lines, and concluded it was "like a playpark for boofing" at flows above 200 cfs. Come the first of this year, the Bakersfield gang finally convinced the rest of us to try out the run, and it was as good as advertised. 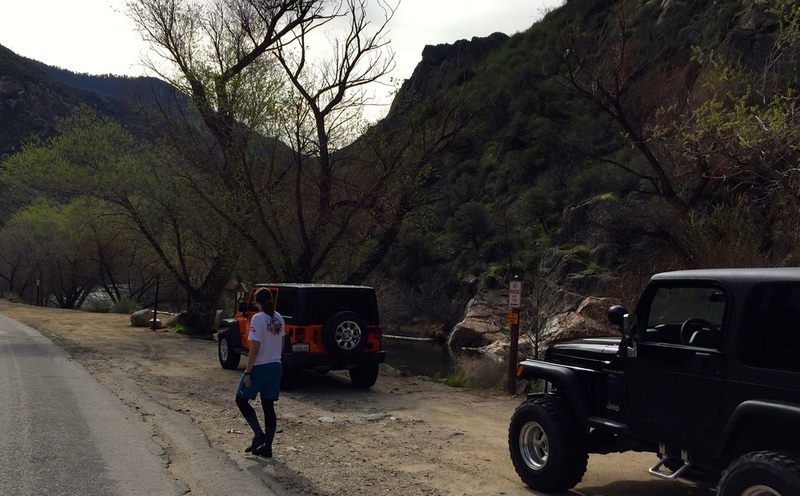 Boaters from Kernville to Orange County were making the trek to run the Mouth weekly, and the Bakersfield gang was enjoying their playground several times a week on after-work runs. But PG&E finally fixed their hydroproject, leaving six boaters on April 16 standing at the takeout staring at unrunnable fish flow. We were skunked. The Mouth might open up again this summer for a couple weeks. As a condition of its license, PG&E is obligated to annually release "freshet" flows into the river to promote the river's health. At its annual meeting with the Forest Service this year, PG&E indicated they may be able to provide freshet flows this year "for 14 days during a short window in June/July." Given the lack of snowpack, the Watermaster will probably be releasing flows in the 200-300 cfs range then. KRB is making inquiries of PG&E as to whether they could give us a heads up when they release these flows. UPDATE 11MAY15: PG&E replied to KRB and pointed us to a realtime gauge for the Mouth. We'll keep our eye on it, and hopefully the Mouth will run for a couple weeks in June/July. Tricia Maki of the Forest Service informed KRB that the new "no parking" signs at Limestone takeout will be taken down today. Although some adjustments might be made to the old loading zone, there should be plenty of space for parking. We'll update this post after we check out the changes. As we face a fourth straight season of drought — and with Edison dewatering 600 cfs from the rest of the upper Kern — we can be certain of one thing this Spring: non-commercial boaters will be flocking to paddle the class 4- Limestone section. It's the only section on the upper Kern besides the class 2/3 Lickety that will be running. The established Limestone takeout at Willow Point is essentially just a long dirt turnout. Historically, the southern one-third of this turnout has been marked by two signs as a no parking loading zone to facilitate commercial outfitter operations. The remaining two-thirds of the turnout were available as free public parking for day users, fishermen, and private boaters. Looking south at the old loading zone. This winter, the Forest Service used its KR3 relicensing money to widen this turnout for additional bus space and improve the wide walking path down to the river suitable for outfitters to carry their rafts. However, the Forest Service also installed two additional signs marking the entire turnout as no parking, loading only. As currently marked, non-commercial boaters (who do not have buses for shuttle and rely on parking their vehicles at the takeout) will have to park well away from the Willow Point turnout and walk Mountain 99 to retrieve their cars and return them to the loading zone. Two new signs have marked the entire turnout at Limestone takeout as no parking, loading only. KRB recognizes the need for a loading zone at the Limestone takeout to facilitate commercial outfitter operations. However, KRB believes the signage change establishing the entire takeout as no parking, loading-only too strongly favors outfitter interests over those of day users, fishermen, and private boaters. KRB has contacted the Forest Service with its concerns. Hopefully, the signage change was simply a mistaken part of the improvement project. KRB has voiced its position that the former signage pattern, which balanced the interests of commercial outfitters with the many other users of this site, should be re-established — preferably before the Spring runoff begins. KRB will keep you updated. The rafts of Kern River Tours navigating Fender Bender rapid of the Thunder Run on the Upper Kern. 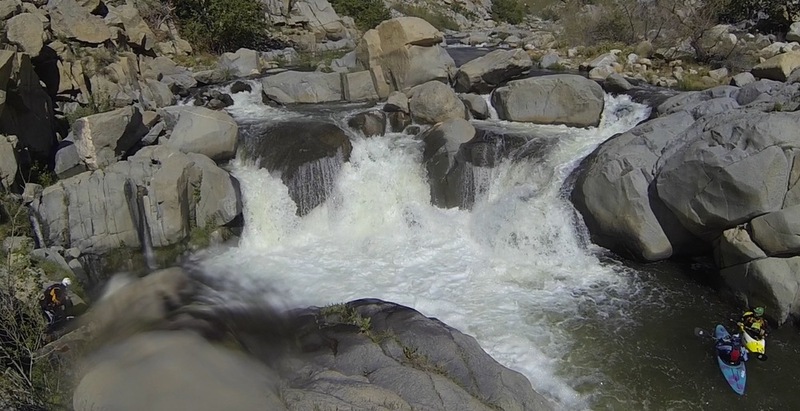 On January 30, 2015, KRB attended the annual meeting between the United States Forest Service and local whitewater rafting outfitters at the USFS Kernville office. Our main purpose in attending this annual event is to keep the concerns of private boaters in front of the decision-makers in the Kern drainage. This year, Al Watson and Tricia Maki of the local USFS office were kind enough to put us on the agenda to seek support for releases on the Lower Kern in mitigation for the adverse impacts entailed by the Army Corps' Isabella Dam project. The outfitters were both receptive and agreeable with the need for guaranteed releases in 2021 — and in other years, but that's for another post. The balance of the meeting was dominated by details of the challenges confronting outfitters in light of what is, at this time, looking to be a fourth straight season of drought. The outfitters all vowed to open their doors this year, at least for a while, but the economics of their operations have, quite possibly, never looked this bleak. We all share hope for a large rain event or pattern that pulls this season out of the drought range. Even a 75% snowpack year would be a great benefit — for outfitters and private boaters alike. Tidbits from the meeting included a moving presentation from Barbara and Rex of Keepers of the Kern. The Keepers became the biggest local story of 2014 by cleaning up the riverbanks of the Upper Kern with the help of their volunteers and private donations. The Keepers will be keeping on and look to expand their efforts down to the lower Kern. KRB's members should consider volunteering for trash pickup with the Keepers if they are able. The USFS reported on how it finally spent its "FERC dollars" (USFS parlance) from the 2004 relicensing of Edison's Kern River No. 3 hydroproject — $300,000. It spent that large sum on a few permanent toilets and some outfitter-requested road, and parking projects to help their buses on the Upper Kern. More than two years ago, KRB made public the fact that the Forest Service had held onto the money from Edison for nine years before bringing the projects to completion. KRB will write a more detailed post regarding how the KR3 relicensing money — like the money from the Borel relicensing which was spent on paving the road to Democrat — went to projects promoted by outfitters with no apparent private boater input. Getting greater private boater input and say on the expenditure of public money constitutes a large part of KRB's mission. Finally, KRB learned that the whitewater park project in Kernville is, for a second year, still lacking construction permits from the county and the Army Corps. Until those permits are obtained, the project is on hold. KRB supports the whitewater park project and will work to ensure it becomes a year-round destination for private boaters. KRB also learned the Brush Creek race is being moved to the weekend after the TJ Slalom race, although there is a chance neither will be held this year unless the snowpack improves. This change will provide boaters interested in both the slalom race and the creek race more time to prepare, as these two races have historically been included in an all-too-busy, single weekend. The change would also move the creek event a week closer to its average high water day, which is in early May. It's time for us — all of us — to petition the Corps. As this document explains, the Corps' Isabella Dam project poses a serious threat to the summer 2021 boating season on the lower Kern. KRB has proposed whitewater releases in mitigation, but that proposal will wither on the vine unless it gets the support of lots of private boaters. and express (1) your concern about the threat the project poses to the 2021 lower Kern season and (2) your preference for whitewater releases to mitigate that threat. You can also mention, if you'd like, that you support Kern River Boaters' comments to the Corps. Whatever you write, let your voice be heard on this important public issue.